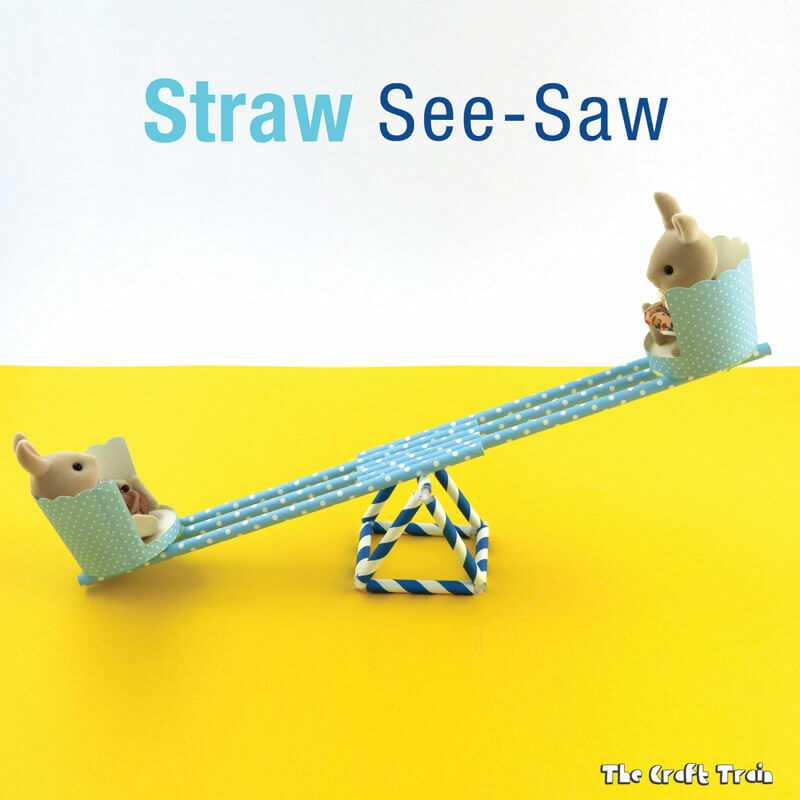 Make a straw see saw for play! 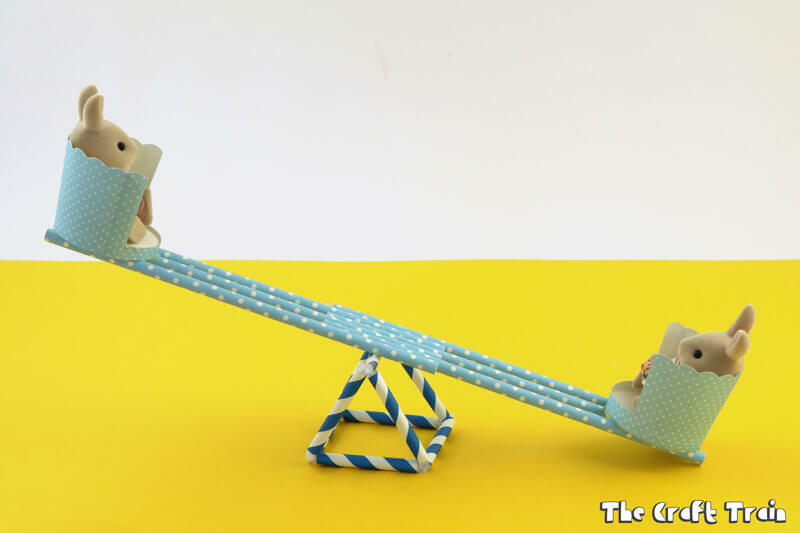 This is a fun STEM craft project which also makes a great DIY toy. 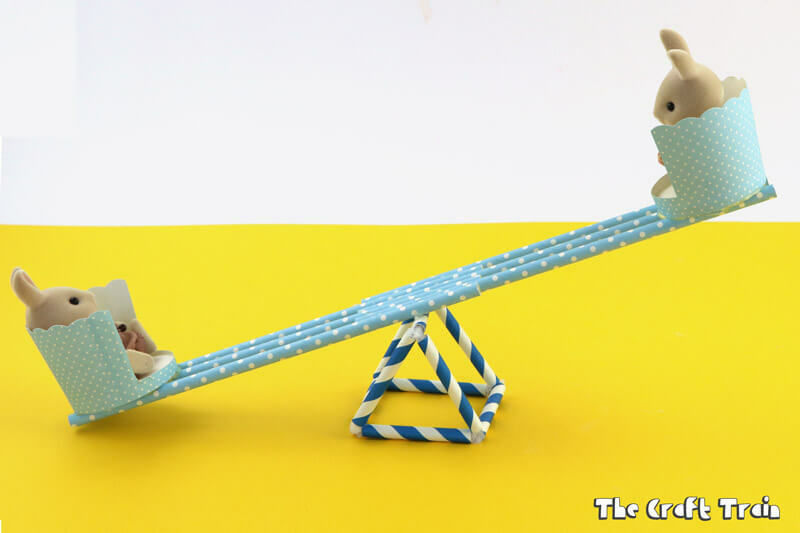 Last week we shared how to make a toy swing set from straws and pipe cleaners. 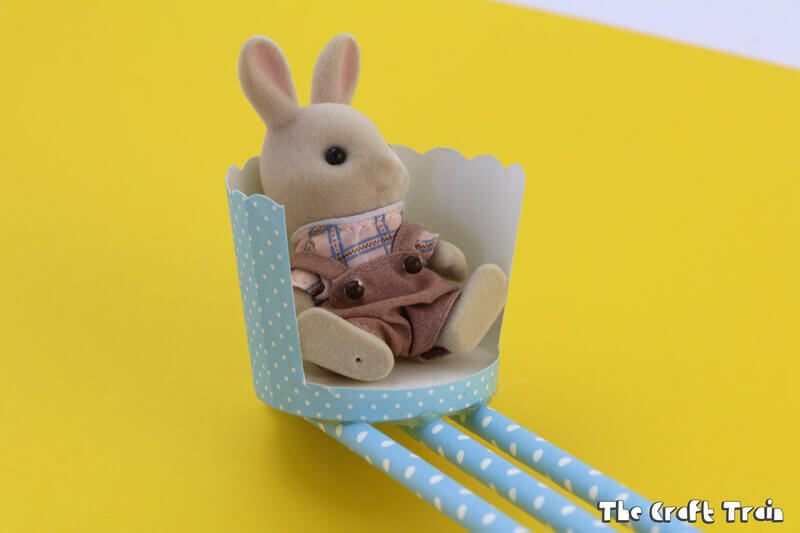 We decided to add another item to the playground for Miss 8’s Sylvanian Family collection – a straw see-saw. We have used a hot glue gun so please supervise your child when making this project (or they might need a little help). There is one change I would suggest if you want to make a straw see-saw too. We found that the critters tend to topple out of their seats when they go up and down so it would be a good idea to modify this design by leaving higher ridges at the front of the seats to stop that happening (i.e. cut a smaller piece out of the cupcake case front). Alternatively you could add a small piece of blu-tack in the base of each seat to hold the critter in place during play. Cut three straws into 9 even pieces. Mine are approx. 5cm in length. Create two straw triangles by using pipe cleaners as joiners. The straw pieces need to be threaded onto the pipe cleaners and then bent into the shape of a triangle. Create a triangular pyramid shape by using the remaining three pieces of straws as sides to connect the two existing triangles together. Cut the front out of the cupcake case, but leave a ridge a little higher at the front than the one in the picture. We found this was too low and our critters topple out when going up and down. Measure approximately 6cm from the end of one straw. Glue a second straw adjacent to the end of the first straw up to the 6cm mark using your hot glue gun. Glue a third straw onto the second straw, keeping it in line with the first straw. Repeat until you have three straws on each end. This will be the ‘plank’ of your see-saw. Measure the half way point on your straw plank and mark it with a pencil line. Trace this line with hot glue and stick one edge of the triangular prism shape on firmly. Wait a few minutes for it to dry properly. Turn upside down so the triangular prism is now resting under the plank and glue one cupcake case seat onto each end of the see-saw. All done, now your see-saw is ready for some fun! 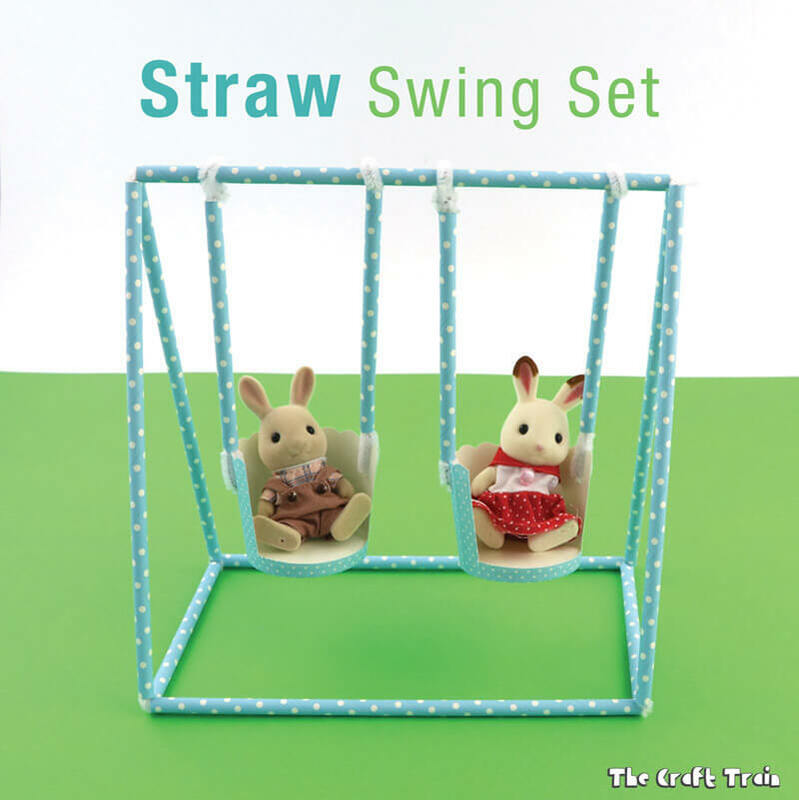 Did you see our matching straw swing set? 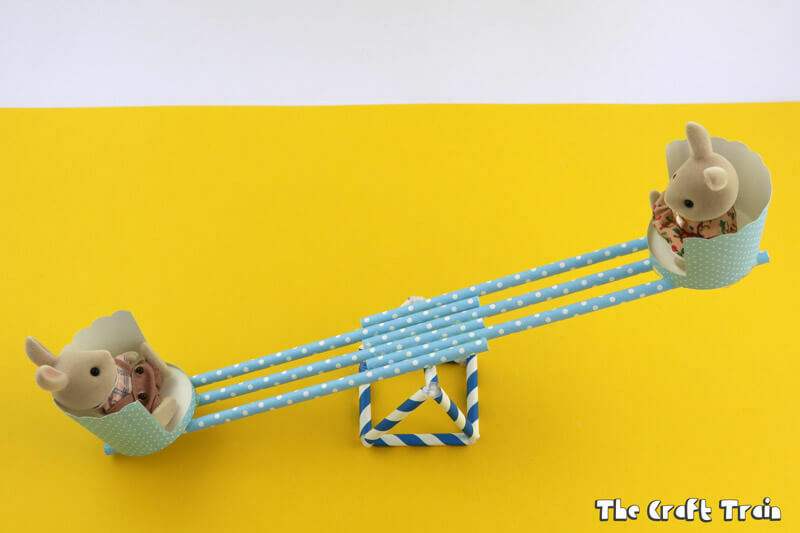 • This coat hanger catapult is lots of fun!